When the Chinese buffet was closed one day, Mike Powers found himself at a gym. He discovered he loved boxing and transformed his health. 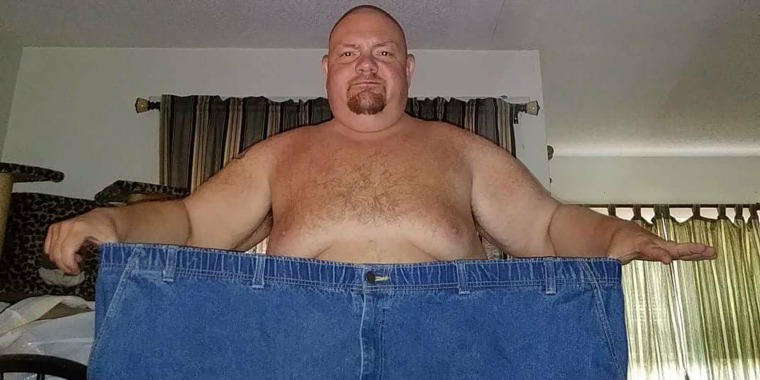 At almost 600 pounds, Mike Powers was unhappy and unhealthy. It took him at least a half an hour to do any physical task. To make himself feel better, he turned to food. At 5 feet 10 inches tall, Powers had always been overweight. He was an emotional eater who rarely watched his portion sizes. But two years ago, his weight and health were spiraling out of control — he couldn’t even put on his shoes or cut his toenails. Powers had type 2 diabetes, congestive heart failure and chronic obstructive pulmonary disease. His doctor warned him he could die if he didn’t make a change. “She said, ‘If you come back in this condition, I don’t know if I can save you,'” he recalled. "That was a scary moment." Still, he did little to change his habits. Then in November 2016, he headed to his favorite Chinese buffet for lunch. He was too early and needed to kill time before it opened. He started wandering around when he spotted Title Boxing Club and decided to check it out. That feeling motivated him to return a few days later. He struggled at first: He was easily winded and couldn't exercise long without taking a break. But he stuck with it. Today, he works out five times a week. He also changed his diet, cutting white carbs, such as pizza, rice, French fries and pasta. He added lean protein, fruits and vegetables to his diet. Every day, he drinks at least eight glasses of water. If he feels sad, he goes to the gym and punches a heavy bag. “Everything that drew me to food, depression or whatever, I turn to the bag,” he said. To date, Powers has lost 250 pounds and now weighs 337 pounds. He needs to lose about 30 or 40 pounds more before undergoing skin removal surgery, but he is focused on being active and eating healthy foods. “I just want to be healthy, happy. It is past losing weight,” he said. Today, he no longer needs to take insulin, and just takes two pills to regulate his congestive heart failure. He's learned a lot about himself through this process. 1. Leave the past behind. Losing 250 pounds in 15 months takes a lot of positive energy. When friends or family criticized him or doubted him, Powers avoided them. He also had to let go of any of his own negative feelings stopping him from succeeding. 2. Find what you love. Boxing helped Powers feel better both emotionally and physically. He believes he stuck with it because he loved it so much. “Find something that is positive that you enjoy doing and that is healthy. Tennis, swimming, whatever. Find something you enjoy doing and take it and run with it,” he said. 3. It’s not a quick fix. Powers understands that to maintain his weight loss and stay healthy, he will always have to eat healthy foods and exercise. “This is my new life,” he said. For more weight-loss inspiration, check out our My Weight-Loss Journey page. And if you're interested in starting your own journey, join our Start TODAY newsletter.